Then, from the drop-down list (below it), choose Copy Material to Others. Save the file. All unused material data will be removed after saving. You cannot see them anymore after reopening. There's an addon Material Utils, which ships with Blender. Select all of the objects you want to remove materials from. In Object Mode, Join them (menu: Object/Join or shortcut: ctrl + 'j'). Remove the material(s) in the materials panel by pressing the '-' button. 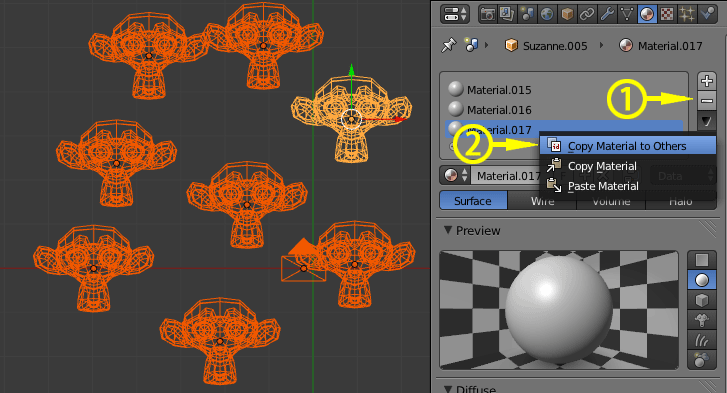 In Edit Mode, select all ('a'), press 'p' and separate (by loose parts in my case) to get your individual objects back. Delete all materials on all meshes and only add one default material to all meshes? “Copy To selected” How do i copy only the material diffuse colour? How can I delete a large amount of Materials? How to merge all identical materials into one? Is it possible to blend two materials on two intersecting objects? 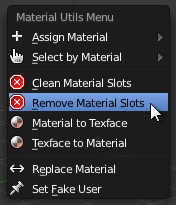 Delete all materials that aren't assigned to a face?